Lapbooking 101: What Are Lapbooks? Maybe you’ve heard the term “lapbook,” but have never investigated what they really are. Or, maybe you’ve seen them advertised on your favorite blogs, splashed across Teachers Pay Teachers, or in your favorite catalogs, but you still don’t quite understand the concept. 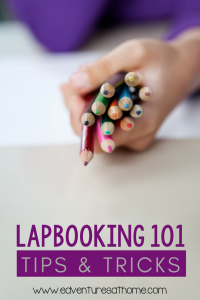 Today, as the first part in our Lapbooking 101 series, we’ll investigate what they are! Here’s a basic definition: Lapbooks are a hands-on, creatively designed portfolio project that allow students to organize their learning into a small, keepsake “book” that fits in their lap. Lapbooks are hands-on. Like the pop-up books you probably remember from your childhood, lapbooks are multi-dimensional and allow children to interact with their learning. Upon opening a lapbook folder, you’ll often find a variety of mini books and pockets that contain illustrations, stories, facts, flashcards, maps, and games. Lapbooks are creative. If your children love cutting and pasting, coloring and designing and creating beautiful works of art, they are sure to love lapbooks! Made from file folders and colored paper that you probably already have handy, the mini-books inside of a lapbook can be made in any number of shapes or colors. Children can also get creative with their learning by adding their own personalized flair, such as drawings, stickers, and other embellishments. Lapbooks are a portfolio. Like a passport, lapbooks provide students with a space to store artifacts of learning, and information can all be stored in one place without the hassle of keeping up with multiple loose papers. Lapbooks are an organizational tool. In the process of creating a lapbook, children are required to sort the facts that they’ve learned into the appropriate pockets and mini books, which helps them begin to develop the study skills necessary for later in life. Completed lapbooks can also be used as a study guide for review, as they contain all of the necessary details from a lesson or unit and the interactive nature boosts retention. Next week in Lapbooking 101, we’ll explore why you should start using lapbooks with your kids! 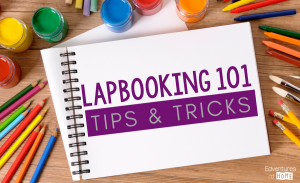 In the meantime, join the conversation by sharing your lapbook photos on Facebook and Instagram with #Lapbooking101 and tag me @edventuresathome. Does Homeschooling Prepare Kids for College? Stocking Stuffer Sunday Blog Hop! Follow Me @edventuresathome on Instagram! © 2016 Rebecca Morley. All Rights Reserved.